First off, it's the Mecklenburg County Sheriff's Office, not the Sheriff's Department. They made that quite clear, from Sheriff Bailey on down. The Sheriff was elected to his office by the voters of Mecklenburg County. 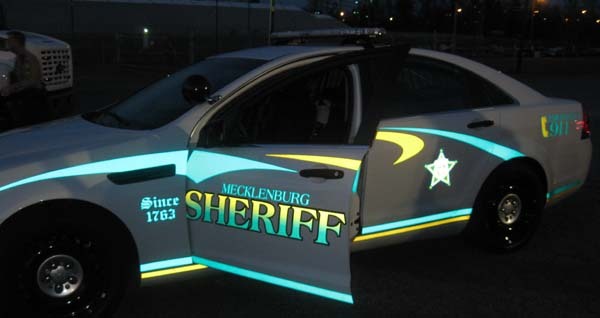 Mecklenburg County provides funding, but the Sheriff's Office decides how to spend it, and it is not a department of county government. Now that the group has been educated, if anyone says "Sheriff's Department," the whole room will let them know about their mistake -- and did. It's hard to believe that it's been two and a half years since I completed the CMPD Citizens Academy class. I decided to see what I could learn about the Sheriff's Office from their Citizens' Academy. Most of the first session was welcoming statements and descriptions of what was coming up. It was apparent from Sheriff Bailey's comments as well as those of the other staff that they are proud of their office and what they accomplish. They are eager to use the Citizens' Academy as an opportunity to showcase what they do to the community and show that they are good stewards of the public's money. They kept referring to the class as ambassadors to the community -- to help the citizens of Mecklenburg County understand the role of the Sheriff's Office. They talked about how the Sheriff's Office has a different mindset from years ago when jail was just a place to keep people. Now they realize that if they put a bad person in and treat them bad, they'll come out bad. The Sheriff's Office now has many programs that help with rehabilitation, including a high school that helps youthful offenders stay on track for graduation after they return to school. We had two regular presentations this week. One was by the Office of Professional Compliance, which addresses and investigates allegations of employee misconduct. It's the nature of the job that people are unhappy with what Sheriff's Office staff do to them, even if they're just doing their jobs. Complaints are to be expected. We also had a demonstration of the Sheriff's Office web site: www.mecksheriff.com. One of the most visited parts of the site is the Inmate Lookup. Mug shots are public information and remain on the site for three years, no matter how unhappy folks are that they're there for everyone to see or with how they look. Next week we start getting to see more of the Sheriff's Office staff at work. Class will be at the Arrest Processing Center. Future sessions will include tours of Jail Central, Jail North, the Courthouse, the Firing Range, and other facilities. We'll get presentations on Gang Intel, Inmate Programs, K-9, and many other activities. It looks to be an exciting ten more weeks! Last week's session was at the Arrest Processing Center. This is a temporary facility near Jail North while the permanent Arrest Processing Center at Jail Central is being enlarged and renovated. It will only be open for another few months. It's laid out as efficiently as possible in the space available, but the permanent center will be better. Anyone arrested in Mecklenburg County comes to this center for processing. There are 34 different local, state, and federal agencies with arrest powers in the county. We saw the inmates passing from station to station getting processed. They seemed mildly curious about these people walking around who weren't wearing either uniforms or jump suits. They get searched, turn over most personal possessions, have a health screening, get intoxication screening if appropriate, and get their fingerprints and picture taken. The fingerprints are taken electronically. The technician places the inmate's fingers on a glass scanner, and they show up on a computer screen before they're recorded electronically. Other technicians check the fingerprints against FBI and other databases to verify the inmates' identities. Mecklenburg County is one of the few counties in North Carolina with technicians certified to match fingerprints to the FBI database. The photographs (mug shots) are available online for three years and can be viewed through the Inmate Lookup web page. Then they appear before a magistrate to have bail set. The magistrates sit in little booths behind secure glass windows. In the movies, prisoners only get one phone call, but here, they can make as many phone calls as they want to try to make bond. (They get to keep cell phones, but phones also are available att he center for local calls.) They can work at it for hours, until they either are able to post bond or it becomes hopeless. Of all the people arrested, only about 30% actually wind up getting transported to jail. The others bond out. We also received a presentation on Immigration Enforcement. During arrest processing, inmates are screened to identify likely illegal aliens. Those that are identified can be referred to US Immigration and Customs Enforcement (ICE). 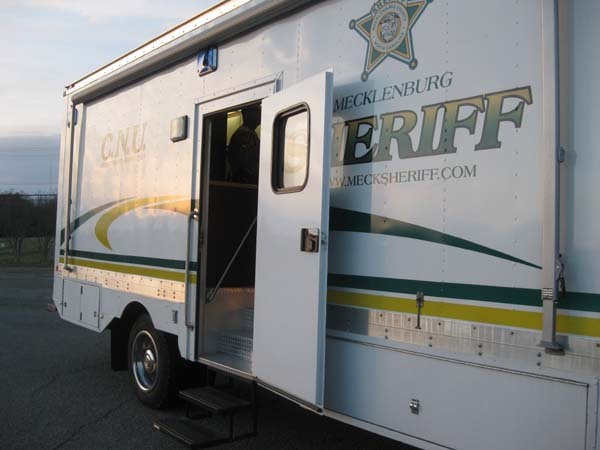 The purpose of the program is not to identify and detain illegal aliens in general, but to identify illegal aliens among those arrested for committing crimes in Mecklenburg County. "You guys aren't paid enough." - Citizens' Academy member. 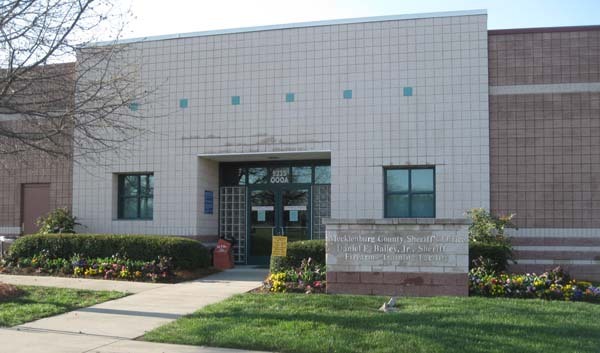 This week's session was at the Mecklenburg County Jail Central. It contains about 38 units or pods with up to 56 inmates in each one. And typically there's only one detention officer in each pod. That's one detention officer watching up to 56 potentially dangerous, certainly unpredictable inmates. It takes a special person to do that. We saw quite a bit of excitement when we went to the pod used for medical and mental health purposes. A guy in one of the cells was quite out of control, banging on the door and shouting threats, very loudly and very profanely. We were told he was in there for domestic abuse. Staff were unsuccessful in calming him down, so they needed a "show of force" to subdue and extract him. The Direct Action Response Team (DART) came in wearing their black uniforms with heavy padding. They executed a coordinated precision drill to pull him out, shackle him, and drag him off, all while he was loudly predicting major misfortune in their futures. It all seemed pretty real, but it turned out to be an exercise. The guy wasn't actually a threat, but the team trains regularly to be prepared when a disruptive inmate might require specialized response. Earlier we had heard about a real event that had just happened when a detention officer was pushed into and locked in a cell with two inmates. It was fortunate that the door was locked, because the officer only had to deal with two inmates rather than 56. He was trained and prepared for that but the situation could have been much worse. Fortunately help arrived quickly, and it did not turn out badly. New inmates generally start out in a classification unit, where their records are evaluated see whether they belong in maximum, medium, or minimum security. Maximum security units generally contain wet cells - those with a sink and toilet. The inmates stay in their cells most of the day, and everyone can be locked down if the situation calls for it. Minimum security units generally have dry cells - those without sinks and toilets. Correction offices would prefer that all cells be wet cells so that they had the flexibility of keeping the inmates in their cells when conditions called for more security. We visited one minimum security pod where most of the inmates were out of their cells sitting at tables. A few were playing cards. A couple appeared to be playing checkers, but most of them were just sitting. They didn't seem to have much to do to occupy their time. We also visited a medical clinic and infirmary unit. Part of the classification process is to identify gang members. Gang awareness is critical to minimize negative effects gang members can have in the jail facility. A gang is any group of three or more people who work together to commit crimes. Some gangs are organized and operate with large nationwide networks. Other gangs are small and loosely organized and can form or fade away quickly. Gang members can be identified by tattoos, clothing, hand signs, graffiti, or totally unexpected clues. We learned that there is no such thing as a gang expert. Gangs evolve over time and come in many forms. Staff working with gangs have to learn to be prepared for anything. The detention officers are the unsung heroes of local law enforcement. They operate behind locked doors with little notice. Yet they have to deal with potentially dangerous situations every day, while still treating inmates with respect and offering them a glimmer of hope that their lives could be better. Jail Central is a pre-trial facility, where inmates are still awaiting trial and haven't been sentenced. Some have been there for many months or even years. Next week we visit Jail North, where "special emphasis is given to inmate programming in an effort to address issues that led to their incarceration...and provide opportunities for change, learning, and growth." One thing I've noticed about Sheriff's Office staff is that they tend to razz each other a lot. The group conducting the Citizens' Academy razz each other. When we go on tours, they razz the staff where we're touring, and they get razzed back. (It seems that the taller people tend get the most abuse.) Someone might think these were insults if they didn't know that these folks got along so well together. I think that's called camaraderie, and it's a major reason why the Sheriff's Office functions so well. Operating a Citizens' Academy isn't very hazardous duty, but the staff certainly encounter hazardous situations. They need to know their partners have their backs, and it's pretty clear that they're prepared to look out for each other. Jail North has room for 614 adult sentenced inmates and 107 youthful offenders. Our tour began at the greenhouse where inmates learn skills that can help them once they get out of jail. They plant flower and vegetable bedding plants that will be distributed to community gardens and other charitable organizations or grown in the jail's garden. The vocational program also teaches carpentry (but a masonry program was dropped due to funding cuts). The Vocational Training Building has the carpentry workshop and classrooms. Jail North offers numerous Inmate Programs to help inmates prepare for a productive life after their time in jail. Inmates have an opportunity to apply for jobs, such as in the library. As they would have to do outside jail, they have to prepare a resume, sit through an interview, and convince staff that they are right for the job. Programs such as the vocational training not only provide useful skills, but also give inmates a sense of accomplishment and a bond with the community, since the plants they nurture and items they build will be used in the community. They receive certificates at the end of the four week program. For some of them, it's the first certificate of accomplishment they have ever received. The inmates work hard to make the programs a success, not only because they know they will benefit from them but also because the success of the programs will continue to benefit others that come after them. They also offer various and numerous programs for youthful offenders, those aged 16 and 17. All youthful offenders are enrolled either in a high school curriculum or GED and have other opportunities for enrichment. Staff who run the programs at Jail North clearly believe in what they are doing to help inmates prepare for their futures and help ensure that they won't be back. But while Jail North places a major emphasis on inmate programming, it is a jail, and security staff work closely with program staff to ensure that both inmates and staff remain safe while opportunities for enrichment are maximized based available resources. The major problem I see with the programs at Jail North is that they don't provide opportunities for more inmates. Funding limits what can be done, as does the availability of instructors. Of every 100 that apply for the vocational programs, for example, only about 10 survive the screening process and are able to get in. Jail North also houses a large kitchen where about 7000 meals a day are prepared for all Jail North as well as Jail Central inmates. The Mecklenburg Sheriff's Office Training Academy is located adjacent to Jail North. Recruiting and Training were covered in the second part of this week's session. The Sheriff's Office offers two career paths. Recruits who have completed North Carolina's Basic Law Enforcement Training, or BLET, on their own (mostly through community colleges) can work in law enforcement as deputy sheriffs, but the greatest need in the Sheriff's Office is for detention officers. Recruits start by submitting an online application. Selected applicants are invited for further evaluation and testing, including physical, psychological, and aptitude testing and interviewing. The recruiting staff goes deep into the applicants' lives, work history, and work ethics. They only want people who believe in the job and really want to do it - not people who are just looking for a paycheck. The extensive and lengthy application process helps ensure that those they accept are appropriate for the job. 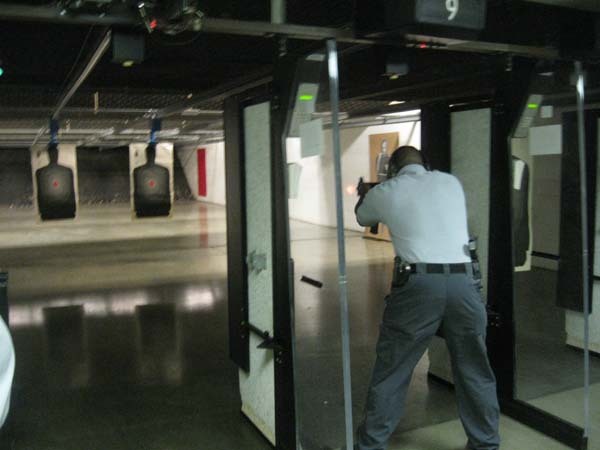 Once accepted, all recruits, both prospective deputy sheriffs and detention officers, go through state mandated detention officer training, followed by post-school, where they learn about operations in Mecklenburg County. Training is both fun and serious, but also rigorous. A primary objective is to turn individuals into a team, because teamwork is essential for survival on this job. 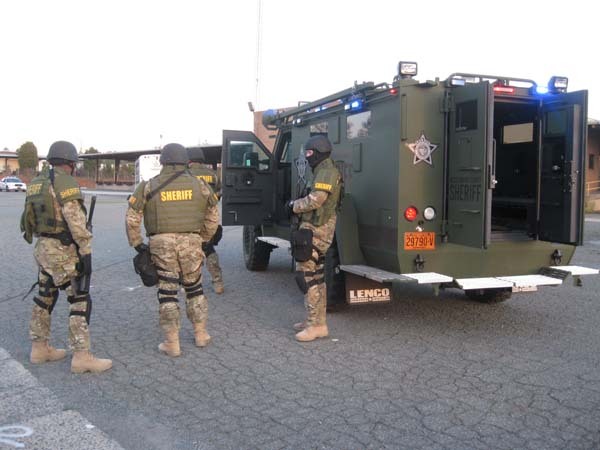 If you think you have what it takes, contact the Mecklenburg County Sheriff's Office Recruiting Staff at 800-400-8500. This week we visited the Work Release and Restitution Center where eligible inmates live while they are employed or actively looking for work but still serving out their sentences. They may leave the center for job searching or for work, but their schedule away from the center and their whereabouts are closely monitored. While at the center, they receive training and counseling that prepares them for a life in the workforce and outside jail and helps them deal with the issues that led them to jail in the first place. I didn't see any locked doors between the residential units and outside the building, except that the inmates have keys to their rooms so they can lock other people out. The Sheriff's Office web site describes the program pretty well. The major problem I see with the program is the same as with many of the programs at Jail North -- that it is underutilized. The center has a total of 160 dormitory style rooms, but one men's unit is not used, leaving a current capacity of 93 in one men's and one women's unit. There currently are only 27 men and 4 women in the program. A major reason for the low participation is flat or reduced funding for staff and other resources. Another is that only inmates convicted of misdemeanors are eligible under state law, and due to shorter sentences, they have a smaller window of time to qualify and complete the program. Of course, many applicants can't make it through the screening process. An articulate young 23-year-old told the group about his experiences. He said he'd been in jail at least once every year since he was 16, but he is determined that this will be his last time. His problem basically was that he was a knucklehead and didn't listen to the people he needed to listen to, but his mindset has changed. He's getting things in the Work Release Program that he never got "across the street" in jail. He's scared of getting out into the environment on the street because it's too easy to make a mistake, but he's better prepared now to walk the straight and narrow. He has a job now that he doesn't like, but it is paying him a salary and helping him get to where he wants to be. He's two years away from a bachelor's degree. His goal is to get his degree and move up to a better job. Another young man told us how the resources at the Work Release Center have helped him. He said he doesn't have to try to figure out where he's going -- he knows where he's going, now. Both of them look like they have good chances for making better futures for themselves. We certainly hope they do. The recidivism in the general jail population is about 70%, meaning that 70% of the inmates will return to jail after they get out. The recidivism at the Work Release Center is about 37 to 38%, which reduces the strain on the criminal justice system. The objective of the Work Release Program is to reduce the number of crimes committed by repeat offenders. It teaches life skills inmates need to lead productive lives and break the cycle of crime. The sheriff's staff want to help people who have lost their way. It is unfortunate that more inmates don't have the opportunity to benefit from this program and potentially change their lives. We hope that the inmates that are fortunate enough to get into the program take full advantage of it and are able to turn their lives around. The Work Release Center also is home to the Culinary School. Is part of the vocational program operated out of Jail North, but the inmates stay and attend class at the Work Release Center. We also had a presentation by the Sheriff's Attorney, who deals with all sorts of litigation, contracts, and other legal issues the Sheriff's Office encounters. One interesting point is that she has to deal with judges' orders that sometimes are inconsistent with the law or violate Sheriff's Office policies and practices designed to maintain the safety of staff, inmates, and the public. She then has to meet with the judges and politely point out their errors. Finally, we learned about the Sheriff's Reserves. These are people with at least 5 years law enforcement experience who have retired or have other jobs. They work on a volunteer basis and perform most of the duties that regular sheriff's deputies do. They also can take off-duty assignments for pay, providing security or traffic control for approved persons or organizations. They work on front line jobs, not for pay but for love of the job. The Sheriff's Reserves currently has 26 members. They each work a minimum of 18 hours a month and save the county approximately $1,260,000 tax dollars a year. They must uphold the same standards and perform at the same level as regular sheriff's deputies. One of the highlights was the top floor, where the judges have their offices and there's a balcony with a great view of the Charlotte skyline. But first we had to get through the front door. About 1,000,000 people a year pass through the security checkpoints at the courthouse. We saw several displays of guns, knives, ninja weapons, and other banned items that people had tried to bring through security. Most of them were obvious, but others would be hard to detect, like a plastic dagger or a gun disguised as a writing pen. The screeners have to be very skilled to spot dangerous items quickly. On the first floor are two of the 34 courtrooms in the courthouse. The first is the video arraignment courtroom. Most of the people appearing in this court do so by video from Jail Central or Jail North. District Court Judge Theo X. Nixon, one of 21 district court judges for Mecklenburg County (District 26), spoke to the group. He said that it costs $110 to house an inmate for 24 hours, and tight budgets (including the state closing prisons and passing responsibilities to the counties) requires judges to use alternative sentencing in many cases. They don't let dangerous or high-risk people out, but for low risk cases, they use community service or other methods. Special courts deal with underlying problems that got folks in trouble in the first place. Judge Nixon commended the Work Release Program and how Sheriff Bailey thinks progressively to help folks escape the cycle of crime. The traffic court also is on the first floor. Once piece of advice they gave was to settle any warrants before you come to court, because they check for those and they could complicate things. My advice is not to get a traffic ticket. People with different types of tickets and in different situations go to different places and follow different routes and see different people. It's all very complicated. The second floor is where you can go to get married. It also has the child care center (Larry King's Clubhouse), which originally was started for jurors but is available for anyone having business in the courthouse. You can be assured your children will be safe here. The courthouse has plenty of security and the child care center has additional safeguards. The third floor has the Clerk of Civil Courts office and other offices. The fourth floor has District Court courtrooms. The Jury Assembly is on the fifth floor. It's a homey little area where potential jurors hang out while waiting to be called for a case. Superior Court courtrooms are also on the fifth floor, including the largest one in the courthouse. It's used for swearing in ceremonies and other special occasions. It's also where high-profile cases are tried. When defendants appear before judges, they typically wear their orange jump suits, because judges aren't influenced by jail clothes. When defendants appear before a jury, they get to wear street clothes so they don't look too much like criminals. However, they have to wear leg shackles under their pants. They get training on how to walk so they look normal, but if they try to run, the shackles lock up so that they won't be able to bend their knees. So they may look normal, but they're still restrained and in custody. We skipped the sixth floor, and the seventh floor is just a shell, awaiting the need for additional courtrooms or offices. Family and Juvenile Courts are on the eighth floor, and judges' offices are on the top floor. 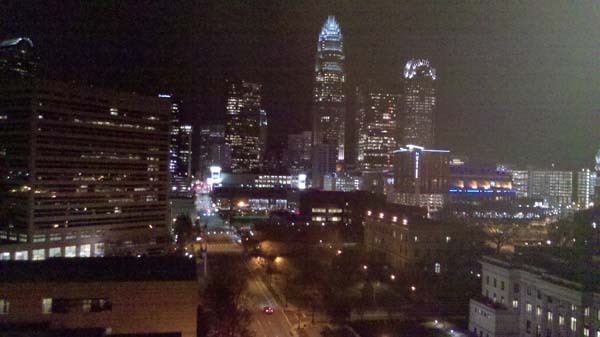 The judges have a nice balcony where they can sit, relax, and enjoy the Charlotte skyline. It's a great place for taking pictures. Finally, we got to see the basement. Inmates come through a tunnel under 4th Street from Jail Central to attend court. They wait in holding cells until it's time for them to go up. Sheriff's deputies take them in elevators located behind the courtrooms where they won't have to come into contact with the public. Also in the basement are the deputies' roll call room and security control, where an officer can monitor cameras located throughout the inside and around the outside of the building. Security is a big deal at the courthouse. Cameras are everywhere. I'd been in the new courthouse once before for jury duty. I'd only seen a little bit of it then, but I know a lot more about all the things that go on there now. It was especially interesting to see the top floor and basement, areas the public hardly ever sees. Twice during this session we were thanked or commended for taking the time to learn about what goes on at the courthouse. But we're the ones who should be thanking the Citizens' Academy for taking the time to share what they do. Great article in today's Charlotte Observer about the horticulture program at Jail North: Expanding program helps inmates learn greenhouse skills. The greenhouse supports 63 community gardens, including one at nearby Carolinas Medical Center-University. The gardens donate the seeds and occasionally put in special orders. Heirloom tomatoes are popular. More gardens are requesting plants grown without synthetic fertilizers. 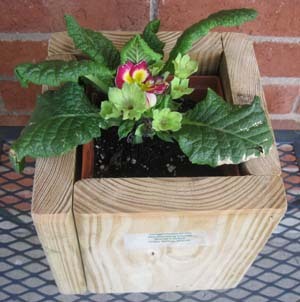 Mecklenburg Jail-North is the chief supplier of seedlings for Friendship Gardens, which supports a meals-on-wheels program, Friendship Trays, that feeds more than 750 elderly and disabled people across the county. The organization has tried to increase the amount of fresh fruits and vegetables it serves to people who receive its meals, and draws on a network of dozens of gardens across Mecklenburg. Those gardens get their seedlings from Mecklenburg jail, decreasing the amount of time it takes to get food from field to fork. An inmate named Shaka, who also declined to give his last name, says it makes him feel good knowing that he’s giving back to the community. His mother has a garden, but he’s never been interested in it until now. And he wants to see the plants he helped grow. There's also a Slide show. I don't know about the "expanding" part in the article title. My impression was that the vocational program at Jail North was struggling for resources. It's definitely a program that helps inmates, and helps the community as well. It can use all the support it can get. 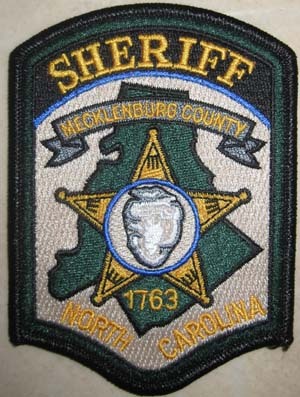 First, this week's giveaway, a brand new Mecklenburg County Sheriff's Office patch, hot of the sewing machine. The Sheriff's Office has adopted a new patch that replaces the date of 1773 with 1763. 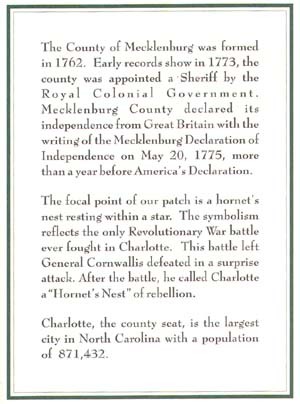 New research shows that the Anson County Sheriff served Mecklenburg County from when it was formed in 1762 until June 1763, when Mecklenburg County got its own sheriff, ten years earlier than previously believed. It'll take quite a while to replace all the patches on all the detention officers' and sheriff's deputies' uniforms. If you see a Sheriff's Office employee with "1763" on their patch, they're probably new...or just got a new shirt. The 1773 date also is on all the cars. We got to see the new Sheriff's Office car design with the 1763 date on it also. However, the patch still has an error. In 1998, Mecklenburg County ceded its northwest corner to Iredell County. This area, known as Meck Neck, was cut off from the rest of Mecklenburg County when Lake Norman was formed. 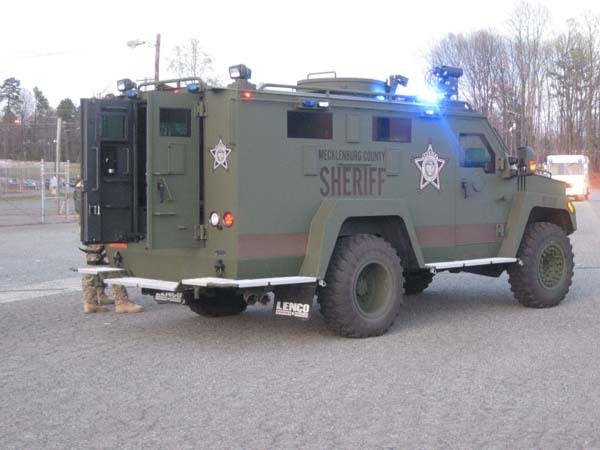 Since it took so long for emergency vehicles and other county employees to get to it, and Iredell County could serve it much easier, the land was transferred. So the corner of Mecklenburg County had a diagonal chunk removed, as shown in the outline map below. The Mecklenburg County map on the Sheriff's Office patch does not show the change and is still squared off. This week's session featured the Crisis Negotiaton Unit and the Sheriff's Emergency Response Team (SERT). But first, we got a bus ride. We were not shackled, but riders on this bus typically are. Capacity is 24 well-behaved passengers; plus there's room for two more not so well-behaved passengers in seats in a special cage, as well as room for a few detention oficers in the front and back. The bus normally transports inmates between Arrest Processing, Jail North, Jail Central, and the Courthouse. We went into an old warehouse that the Sheriff's Office uses for training exercises. In a special training scenario, we saw a man being served at his house with papers terminating his contact with his children and ordering him to appear in court the next Monday. He wasn't happy about it, waved a golf club at the deputy, and was generally pretty disagreeable. A little while later the Crisis Negotiation Unit and Sheriff's Emergency Response Team showed up outside and asked him to come outside. The unhappy man retrieved a pistol and got pretty agitated. He told them to go a way and brandished the pistol out the door, but he couldn't convince them to go away, and they couldn't convince him to come outside peacefully. The Crisis Negotiation Unit dropped off a phone at the man's front door, and he brought it in. We heard the man talking on the phone with a negotiator and on his cell phone with his ex-wife. (They didn't get along.) Finally, it became apparent that the man wouldn't come out, and the SERT came in and easily convinced him to surender. 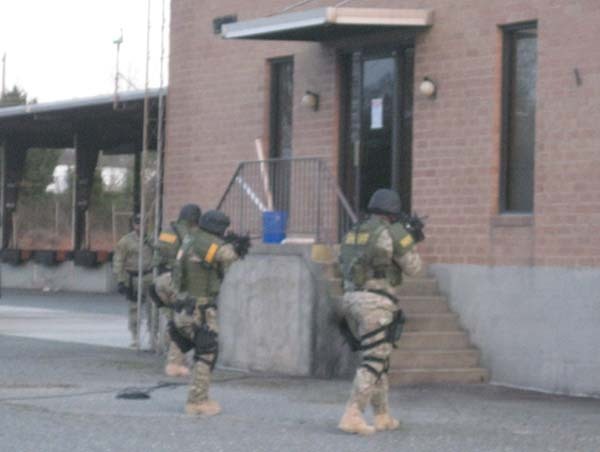 SERT is equivalent to SWAT elsewhere, and they were prepared for a fight. The man was upset that the court, the Sheriff's Office, and everybody else seemed to be siding with his ex-wife, but actually all he needed to do was take the papers and show up at court the next Monday. He would get his chance to tell his side of the story then. After his behavior this day, the court probably wouldn't give him much sympathy, though. Then we went outside and saw the scenario from the other perspective. In addition to the Crisis Negotiation Unit and SERT, other sheriff's deputies would have been involved, evacuating nearby homes and creating a perimeter. The Crisis Negotiation Unit has a truck with two key rooms. The negotiators are closed off in a room in the back. The command staff are closed of in another room in the front. They monitor developments and decide when it's time to cut it off and send in the troops. All the members of the Crisis Negotiation Unit are volunteers that have other jobs within the Sheriff's Office. (The negotiator gave the presentation on the Office of Professional Compliance on the first night of the Citizens' Academy.) In a real situation, it might take them an hour or so to assemble from their posts from throughout the county, and the negotiation would take much more time. Their objective to achieve a boring, safe outcome. But if the negotiation is unsuccessful, SERT comes in. In a real situation, the house would have been full of smoke and gas, and things would have been much noisier. SERT has a Bearcat armoured vehicle at their disposal. They wear Kevlar helmets and plenty of soft body armour. they seemed to prefer riding on the outside. 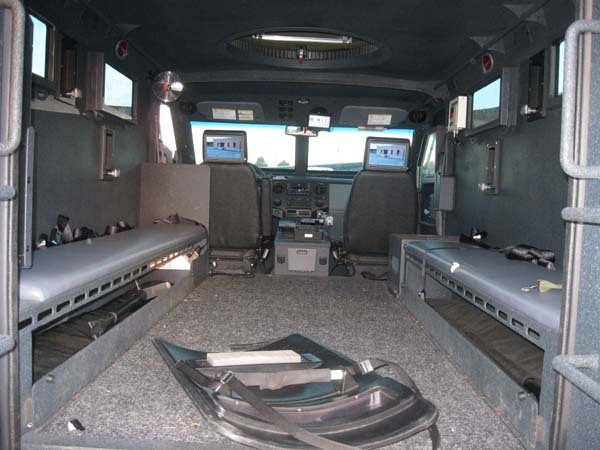 In the picture showing the inside of the Bearcat, there's a heavy-duty crowbar and a shield. The Bearcat is equiped with a regular camera, which was aimed at the objective, and also a thermal camera that they can use to locate folks behind fences or walls or in the woods. After the demonstration, we took the bus back to the training academy and were introduced to the 14 SERT members and their ordinance, which was substantial. They had AR-15 rifles, UMP submachine guns, Remington 700 sniper rifles, a gas grenade gun, and various cannisters to send smoke, gas, pepper spray, and other distractions into an area containing people they need to subdue. 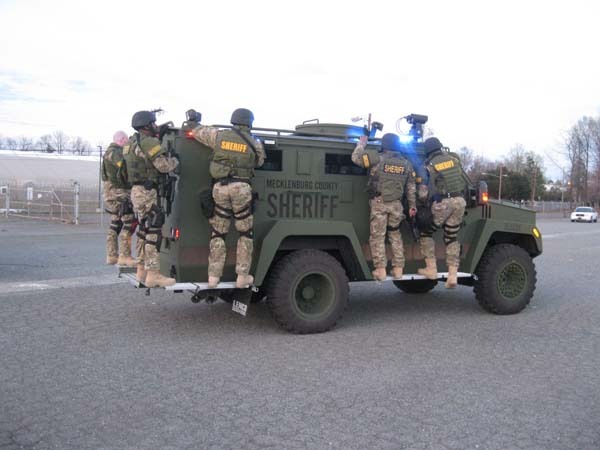 SERT has higher standards than those for general sheriff's deputies. They have to score 90 or more on the firearms test. (The Sheriff's Office standard is 80.) Most of the team score 94 or higher. They also have to pass a rigorous fitness test, while wearing full SERT gear. Finally, they interview with the team, and the team votes whether they should be accepted. Like the Crisis Negotiations Unit, they have other jobs within the Sheriff's Office. They train about one day a month to be prepared for a whatever emergency situation might come their way. The final presentation was on the Community Services activities of the Sheriff's Office. They work with schools, churches, and other groups to set up demonstrations, and they support various charities and charity events, such as food drives. They also operate the Citizens' Academy. They are proud of what the Sherrif's Office does and want to share with the community. Saturday, we went to the Firearms Training Facility, which is located next to Jail North and the Sheriff's Office Training Facility on Spector Drive. The image below shows a sub machine gun demonstration at the range. We learned about tasers, which can be used to fire two wires with fishhook tips at an uncooperative person. The taser then can project an electric current through the wires, inflicting sufficient pain on the person to totally divert their attention away from being uncooperative. Any sheriff's deputy who carries a taser must experience being shot by one, which will become the "worst five seconds of their lives." The older model used by the Sheriff's Office, the X26, projected an electric current as long as the user pressed the trigger. A prolonged current, up to 30 seconds, can cause additional trauma. The newer model now in use, the X2, will turn off the current after 5 seconds, but the uncooperative person can be retased if they don't submit. Unlike the older model, the newer model has coated wires that can be touched while the current is flowing. We saw a cardboard cutout being tased several times without flinching, but it's not an experience I would like to have. I know the current hurts, but those fishhook tips really look scary. The Sheriff's Office uses two types of modified training guns. One doesn't shoot anything and is just used for trainees to get used to carrying a gun around. The other shoots Simunition cartridges. Trainees and deputies fire these at each other during training exercises. They aren't lethal but hurt more than a paintball and help them learn to react to the pain and keep on fighting. The Sheriff's Office uses three versions of the Glock .40 caliber handgun, the larger Glock 22 for line staff, the medium sized Glock 23 for captains and administrative staff, and the smaller Glock 27 for plain clothes users and SERT. These are considered 100% reliable. The Sheriff's Office uses an 870 model Remington Shotgun. These can cause a lot of damage, but the familiar sound of racking the shotgun is quite an attention getter and often is sufficient to bring about a quick surrender. They had a Kevlar helmet that had been hit by a slug from a shotgun. Fortunately no one's head was in the helmet at the time, otherwise the head would not have been in very good shape. The number one objective at the Firearms Training Facility is SAFETY! Ear protectors, eye protectors, constant vigilance by the instructors, and many other safety practices are standard operating procedure. The training not only teaches how to shoot but also if and when to shoot. Learning to make the decision on whether or not to potentially take a life is just as important as the basics. The instructors were having a good time showing us a good time, but they clearly take their responsibilities to prepare the sheriff's deputies very seriously.